are in order to committee members Jeanne & David Jones who were awarded the ’Alan Ball Memorial Unsung Hero of the Season Award’ at the end of season Gala Ball. The award is presented by the ExEC-100 Club each year to someone who works unseen behind the scenes for the football club. Well done Jeanne & David and many thanks for all the work you do for ECDSA as well – it is very much appreciated. Our congratulations also go to our Chairman Nick Saunders who has been elected to the board of national charity Level Playing Field (LPF) as an executive trustee. Nick works tirelessly in his quest to help improve the facilities of disabled supporters. He sees his new role at LPF as not just being about what benefits it will give to Exeter City, but how all ‘small’ clubs can benefit from his input and insight. Our thanks goes to Colin Atkins who has decided to step down from his position as ECDSA committee member and fundraising officer after 6 years of loyal service. During Colin’s time as fundraising officer he has helped us raise many thousands of pounds to help us help Exeter City improve the match day experience of both home and away supporters with disabilities and has also over the years held positions of vice-chairman and membership secretary. Chairman Nick Saunders said “Over the years Colin has been a massive force in many of our fundraising activities and in particular the Christmas Draw which has been a very successful fundraising event for us. We’ve been very fortunate to have had someone like Colin on the committee and his presence will be greatly missed”. 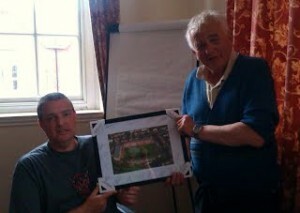 As a token of our appreciation Colin was presented with a signed picture of St James’ Park. 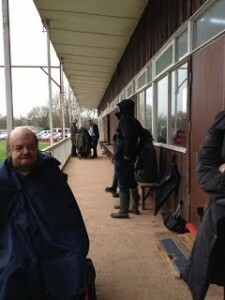 Breaking Wind at the Park – an opportunity to help disabled supporters and advertise at the same time. No, No, No it’s not that sort of article – let me explain. Have you ever sat on the beach and wished you had brought a windbreak with you? If so, you will know it can get chilly when the wind blows even with the sun shining. Well it’s the same for wheelchair supporters at St James’ Park – when the wind blows across the pitch it can get mighty cold in those disabled bays without some protection. 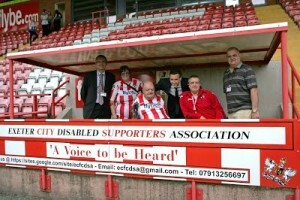 So Exeter City Disabled Supporters Association (ECDSA) have decided to do something about it. Working with the club, permission was given to erect a windbreak at the front of the disabled bay (area 2) which is situated at the front of the Flybe Stand close to the half way line. As you can see in the before and after photographs ECDSA now have a dual purpose board – primarily to act as a windbreak for wheelchair supporters but also to give ECDSA a little bit of publicity. So on match days if you would like to meet up with ECDSA committee members to talk about how ECDSA can help improve the match day experience for disabled fans then you will know where to find us. There are a further 5 disabled bays around the ground which could benefit from a windbreak / advertising board so there is now an opportunity for other advertisers to come forward and help erect the same for the other disabled bays. So if you are interested and would like to help to ‘break wind’ at the Park then get in touch with the clubs commercial team by emailing: commercial@exetercityfc.co.uk or ring 01392 411 243. ECDSA committee members launch new windbreaker/ad board before match on Sat 21st Sept.
EXETER CITY DISABLED SUPPORTERS ASSOCIATION visit St Loye’s Foundation who have been providing employment and training services to people with disabilities and chronic health problems for over 75 years. There have been some changes in New North Road recently. You may have noticed that the old Debenhams building has had a bit of a revamp and become John Lewis but wander down New North Road, cross over Longbrook Street and a little further on you will find Beaufort House and St Loye’s Foundation. As members of the association (ECDSA) found out on a recent visit, St Loye’s Foundation moved into their current premises in 2012, but have a very long history in Exeter with Her Majesty the Queen as their patron. This nationwide charity provides the support and practical knowledge disabled people need to access employment. ECDSA met with Phil Roberts and Helen Trivett who kindly showed them around the impressive training facilities and explained the background and ethos to St Loye’s. ECDSA also met with a number of employees who had trained through St Loye’s and had now become staff members helping others in the same way that St Loye’s had helped them. ECDSA are extremely grateful to St Loye’s for a very informative visit resulting in a valuable link being forged between the two organisations whose aims are both focused in helping people with disabilities. In addition, ECDSA have offered to provide support to St Loye’s clients, wherever possible, to enable them to enjoy live football at Exeter City FC. 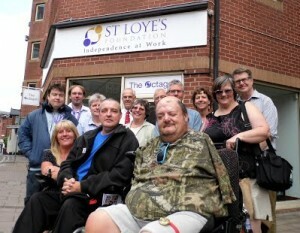 Pictured– members of ECDSA and St Loye’s Foundation outside Beaufort House. Cast your mind back to last Christmas when you bought an ECDSA Christmas draw ticket in the hope that Santa would bring you a Jaguar to drive around for the weekend. Well for lucky winner John Laskey his Christmas wish came true when he recently collected the keys of this new Jaguar from Alistair Mills of Grange Garage. Alistair Mills said ‘Here at Grange we are always happy to support the ECDSA. 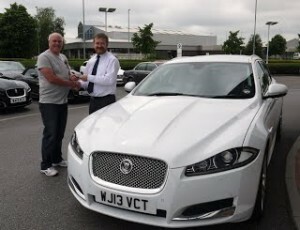 I’m sure John Laskey is still smiling from the experience he had using the Jaguar XF Sportbrake for the weekend. Exeter City is an example to all clubs in the way the Supporters rally to make everyone feel part of it, which is one of the reasons, the Christmas Draw is always a success’. Our Chairman, Nick Saunders said “Everyone at ECDSA are hugely grateful to Alistair Mills at Grange Garage for such a fantastic donation to our Christmas Draw. It is the third year in a row that we’ve been able to offer such a fantastic incentive to enter the draw, which makes an unbelievable difference to our fundraising. It is great to have such committed support from a local company, and it shows that they understand the importance of what ECDSA are trying to achieve for Exeter City and those with disabilities”. Our thanks go to Alistair Mills and Grange Garage plus all the businesses and individuals who donated prizes for the 2012 Christmas draw as well as to everyone who bought draw tickets. Photo L/R: ECFC Disability Liaison Officer & ECDSA Chairman Nick Saunders, ECFC Footballer Alan Gow, Pluss Chief Finance and Operations Officer Paul Love, and ECFC Youth Commercial Manager David Evans launched the new windbreak with the help from ECDSA committee members. Pluss is proud to be the first organisation to help out the disabled supporters of Exeter City Football Club by providing a wind break for the front of the accessible viewing platform. 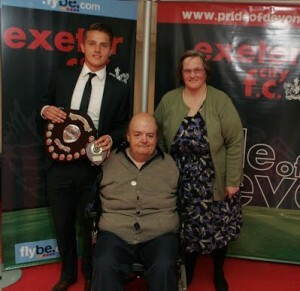 EXETER CITY DISABLED SUPPORTERS ASSOCIATION are delighted to offer its congratulations to Jeanne Jones who has been awarded ‘Volunteer of the Year’ for 2012/13 by Level Playing Field (LPF). The Volunteer of the Year Award is offered each year by LPF to a club volunteer who has encouraged the participation and inclusion of disabled supporters or has worked to break down barriers and stereotypes at their football club. 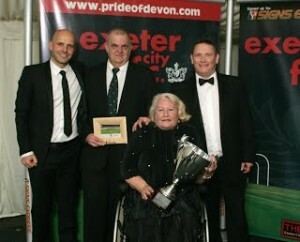 On learning about Jeanne winning the award ECDSA Chairman and Disability Liaison Officer at Exeter City, Nick Saunders (who himself won the award back in 2009), says “Jeanne is a very worthy winner because she is everything Exeter City is all about, i.e. ‘everyone working together for the better good, for their football club’. 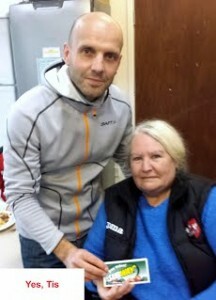 Although Jeanne uses a wheelchair because of her disability, this never gets in the way of her volunteer work throughout the week for the football club, supporting the club as a season ticket holder, following the team to away matches plus a lot of other things she does for other Exeter City related groups”. Joyce Cook OBE – Chair of LPF says “Everyone at Level Playing Field would like to congratulate Jeanne on being awarded the Volunteer of the Year Award by LPF. This award is very well deserved as recognition for her years of dedication and hard work as a volunteer, assisting disabled supporters at Exeter City and ECDSA”. You don’t have to look far to find Jeanne – she will either be at the Cat & Fiddle training ground where she helps out with preparing and serving players lunches or at the Park where she helps in the accounts department. On match days Jeanne will be at the entrance used by players, officials, stewards, journalists & photographers by booking in arrivals, issuing passes and making everyone feel very welcome. If that’s not all, Jeanne is also Secretary for us here at ECDSA. On hearing of being awarded the LPF ‘Volunteer of the Year Award for 2012/13’ Jeanne said “I am delighted to have received this award. I really enjoy being involved at Exeter City FC and helping out where I can but I couldn’t do what I do without the help of the many other volunteers and staff at the club together with my husband David”. Jeanne will be presented her award on Saturday 22nd March when Exeter City play Fleetwood Town up at the park by a representative from Level Playing Field. This will coincide with LPF ‘weeks of action’ 2014. THERE WERE NO HOLES IN OUR BUCKETS WHEN EXETER CITY DISABLED SUPPORTERS ASSOCIATION (ECDSA) COLLECTED A WHOPPING £394.05 DURING THE HALF-TIME COLLECTION AT THE PLYMOUTH ARGYLE MATCH ON SATURDAY 5TH OCTOBER 2013. Chairman Nick Saunders said “This is a fantastic amount to have collected in just 10 minutes during half time. On behalf of ECDSA, I would very much like to thank the supporters of the club for their overwhelming generosity together with all those who gave up their half time cup of tea to undertake the collection. This is the 6th time the football club have given ECDSA permission to hold a half-time bucket collection for which we are extremely grateful. The bucket collection gives a huge boost to our funds, enabling us to make more improvements to disabled facilities at the Park. The money from this year’s collection will help ECDSA repair, paint, and upgrade the disabled toilets within the stadium complex”. EXETER CITY DISABLED SUPPORTERS ASSOCIATION’S Christmas Draw took place on Wednesday 11th December 2013. The draw was attended by City players Aaron Dawson and Alan Gow, Alan is also President for the association and Stuart Doderer and his good wife, Khamal from GreenMyBusiness.co.uk. ECDSA is pleased to announce that a sum close to £800 has been raised from the draw which will be used to help improve disabled facilities at St James Park for supporters with disabilities. ECDSA would like to thank all those who so kindly donated prizes for the draw including:- Grange of Exeter, Frances Farley (Meal for 2 plus players at Strada), GreenMyBusiness.co.uk, Midas, Subway of Sidwell Street, Original Style Tile Superstore, ECFC Supporters Trust, Exeter City Football Club and ECDSA committee members together with everyone who purchased draw tickets. ECDSA chairman Nick Saunders said ‘the Christmas draws are a major fundraiser for us, but without the support of local business and individuals ECDSA could not achieve as much as it does in helping to make the match day experience at Exeter City so much better for all disabled supporters – thank you all so very much’. Jeanne Jones meets up with Paul to hand him his prize. Level Playing Field ‘weeks of action’ is from 15th – 30th March and their calling on all football clubs and fans to get behind their drive to make the match day experiences the same for everyone. Everyone here at ECDSA fully supports the ‘Level Playing Field’ campaign and to show our support we’ve organized an event out at the clubs Cat & Fiddle training ground to watch a players training session and to meet Paul Tisdale and the players afterwards. Late last year Jeanne Jones was announced as being awarded ‘Volunteer of the Year’ by LPF. The award is given to those club volunteers who have encouraged the participation and inclusion of disabled supporters or has worked to break down barriers and stereotypes at their football club. On learning about Jeanne winning the award ECDSA chairman, Nick Saunders (who himself won the award back in 2009), said “Everyone at ECDSA and myself are so pleased for Jeanne as she’s a very worthy winner because she is everything Exeter City is all about “everyone working together for the better good for their football club”. You don’t have to look far to find Jeanne – she’ll either be at the Cat & Fiddle training ground where she helps out with preparing and serving players lunches or at the Park where she helps in the accounts department. On match days Jeanne can be found at the entrance used by players, officials, stewards, journalists & photographers by booking in arrivals, issuing passes and making everyone feel very welcome. If that’s not all, Jeanne is also our Secretary here at ECDSA. On hearing of being awarded the LPF ‘Volunteer of the Year Award’ Jeanne said “I am delighted to be winning this award. 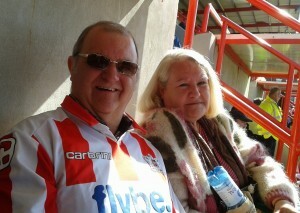 I really enjoy being involved at Exeter City FC and helping out where I can but I couldn’t do what I do without the help of the many other volunteers and staff at the club together with my husband David”. 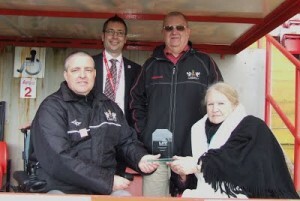 Jeanne was presented her award at the Fleetwood Town match by no other than our very own Nick Saunders (ECDSA chairman & ECFC DLO) who is a Trustee at Level Playing Field. So on damp and drizzly Thursday morning ECDSA ventured along to the Cat & Fiddle training ground to see at firsthand the team’s preparation for the game against Bury on the Saturday. 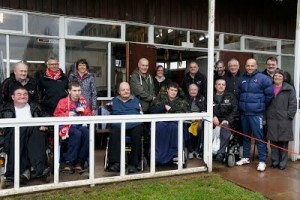 The invitation for the Disabled Supporters Association to attend a training session was kindly made by the football club in support of ‘Level Playing Field’s’ ‘Weeks of Action’ to show what is being done in Exeter to help promote inclusion for disabled supporters and to encourage more disabled people to attend games. 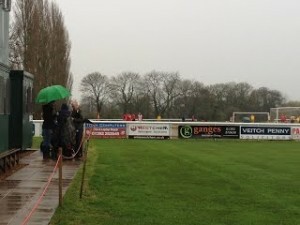 A warm welcome to the 15 or so ECDSA members was extended by both Steve Perryman and Paul Tisdale as Matt Gill kept out of the rain by stretching out his calf muscles on the bench. Training kicked off at 11.00 as we watched a series of warming up exercises followed by some intensive practice on how to clear the ball from your own danger zone using a combination of short passes between 3 players to work sufficient room for one of them to clear down field. At the other end another 3 players were working a similar routine and within a few moments the ball came back to the original 3 players. This went on for 20 minutes or more. Amongst other routines we witnessed were corner & free kick deliveries and keep ball (only 2 touches allowed) with training ending with a high action game. All in all the players were out there on the training pitch for 2 hours – quiet exhausting stuff (for us spectators anyway). As training finished and our morning came to an end several players, including Liam Sercombe & Scot Bennett to mention just two of many, spent several minutes talking to ECDSA members about the training session and the game against Bury on the Saturday. As a memento of our visit the club gave each ECDSA member a signed team photograph and the dedicated refreshment team of volunteers even found time during the preparation of lunch for the players to provide us with tea, coffee & cakes. ECDSA would very much like to thank the club, management, players & volunteers for making our morning so welcoming and enjoyable. Members have been voting again for this season’s winner with the award going to a player who has cemented his place in the first team and has improved the most in our members eyes. Tom made his debut for City at Sheffield Wednesday’s Hillsborough ground at the end of the 2010/11 season at the tender age of 17 having graduated from the academy. He joined the Grecians in the under-11 age group and went on to score his first senior goal against Chesterfield the day before his 18th birthday, contributing to a 2-1 win at the beginning of the 2011/12 season. Tom’s chances to add his sharpshooting to the City team were limited in the 2012/13 season, as he spent much of it away from the Park to experience first-team action in the Non-League. However through determined hard work Tom forced his way into the City side this season, featuring regularly throughout and scoring on 6 occasions making Tom a worthy winner of the Most Improved Player of the Year Award for 2013-14. Tom was presented with his award at the ‘Road to Rio – Gala Ball’ on 4th May by committee members David & Juanita Turner. 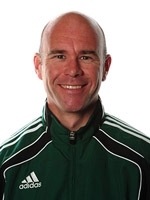 We are delighted to announce that Mike Mullarkey (Premier League and FIFA Assistant Referee) has accepted our invitation to become ECDSA Ambassador. Committee members recently met with Mike and explained our history, past achievements and our vision for the future. Mike who ran the line in the 2010 World Cup final between Spain & Holland is again officiating at the 2014 World Cup along with fellow Assistant Referee Darren Cann and Referee Howard Webb. ECDSA Chairman Nick Saunders says ‘We are absolutely delighted and honoured that Mike ‘a local lad’ has kindly agreed to become our Ambassador. With Mike being involved in the professional game at an extremely high level I’m sure he will be able to help us in many ways in our quest to make St James’ Park fully accessible for all supporters with disabilities as well as supporting us as an association with other things we do for our membership and Exeter City Football Club’. We would like to wish Mike the best of luck on his forthcoming World Cup in Brazil. Hello & welcome to this the 7th Annual General Meeting of the Exeter City Disabled Supporters Association and the following is my Chairman’s report. Now in our 7th year membership has increased for the 6th time out of those 7. As with every year, our goal is to have 100 members or more and this is still achievable. If we could ask every member to ask someone to join our association this would help us achieve our target. We continue to have strong ties with other supporter groups with one of those groups, the East Devon Grecians being members of ECDSA and we’re ever present at the Grecian Group Forums. We have great ties with ‘One game, one community’ as their Chairman is also a member of ours and with disability on their agenda, working with them makes us both stronger. This puts Exeter City ahead of other clubs in many ways because how many clubs can say their supporter groups are working together to help their club. 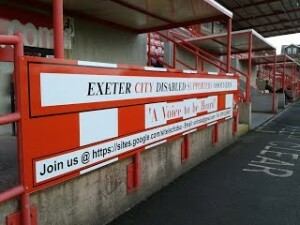 As announced at last year’s AGM, we are trying to work with other local disability organisations which ensures we have a wider reach within the community in promoting what we do for our football club and for those with disabilities and show what Exeter City has to offer those with disabilities and this is not just what’s on offer on a match day. More on this too follow in this report. Exeter City Online Ticketing: Exeter City started using a new online ticketing service and for the first time after years of us trying, those with disabilities can finally buy tickets online and those needing a personal assistant can get this ticket free at the same time. ECDSA President: Alan Gow was our President for a second year but sadly has now left the club and we’re at present looking for a new President. Windbreaker for designated wheelchair bays: Over many years of trying to get windbreakers fitted to the front of the bays to help keep out the wind and rain. 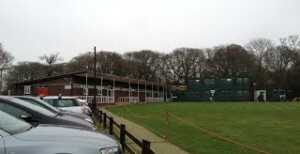 With the help of the clubs commercial department we’ve been able to get windbreakers fitted to two bays. We decided ourselves to have one made up by Signs Express and had this fitted to bay 2 in the WTS Stand to promote ourselves. With months of very hard work, myself and the clubs commercial department we were able to get Pluss of Exeter on board and their windbreaker is fitted to bay 3 (again in the WTS Stand). These windbreaker’s helps greatly in bringing in more money for the football club and in turn benefits those using these bays. Companies are in a way getting a ‘buy one, get one free’ deal as their helping the football club and those with disabilities. We’re hopeful that more companies will follow suit, but this does take time as we know. St Loye’s Foundation visit: One of our goals as stated above was to work with local disability groups and last year we visited the St Loye’s Foundation. They offer training to people with disabilities and they are given skills to get back into work. Our visit was a great success and we’re going to be working with them in the near future on something that would benefit us both. I’m hopeful that we can build ties with other disability organizations. Bucket collection: The football club kindly gave us the Plymouth match for our yearly bucket collection and for the first time all the collectors we’re ECDSA members. We decided that the money raised would help us repaint and improve the disabled toilet inside the stadium which is taking place very shortly. Level Playing Field membership: We continue to be fully paid up members and this ensures we can get the advice and support we need to sort any disability issues out which we’re unable to do ourselves. The great news is that Exeter City has also become fully paid up members of LPF. This was made possible with the help and support of Paul Farley (ECDSA member & Supporters Trust trustee) and that of the Supporters Trust. Committee member stands down: Sadly our founding committee member; redevelopment representative and ex-treasurer Margaret Atkins stood down from the committee due to family commitments. We thanked Margaret by presenting her with an engraved vase at our Christmas draw evening for many years of service given to ECDSA and helping us make ECDSA what it is today. Stadium redevelopments and new representative: Our compiled Priority List is still active but there has been no activity in the past year which means we’re unable to give you any progress report. Jeanne Jones was appointed are new representative. Christmas draw: Our draw was another great success and we had fantastic prizes up for grabs again and the support from local companies was fantastic and our thanks goes to the clubs commercial team who again helped by kindly contacted companies on our behalf. The Grange of Exeter again kindly donated a Jaguar car for the weekend. Midas donated 2 complimentary 4 ball golf days for St. Mellion and Trevose. It was not stated on our posters. However, Frances Farley kindly donated the fantastic prize of a Meal for 2 at Strada with Rob Edwards and another city player. “Thank you Frances so much”. 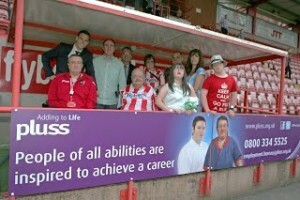 Exeter City FC donated Match day hospitality for two and Signed football. Original Style donated an Electric tile cutter. Wales & West Utilities donated a Sat Nav and a Digital Camera. greenmybusiness.co.uk donated a Signed Michael Caines cook book and a £25 credit voucher. ECFC Supporters Trust donated a couple of Exeter City books signed by Paul Tisdale and Steve Perryman. Subway of Sidwell Street donated 2 Subway vouchers. The following was donated by our committee members: Blu-ray player; Napoleon extra old cognac; Tins of sweets and Christmas crackers. Extra item bought by ECDSA: Fair-trade Christmas Hamper. All ticket matches: We raised an issue with the football club about selling an away clubs tickets for ‘all ticket matches’ and selling them without using the clubs own ‘priority system’. The issue is when the club has been given a very limited number of wheelchair spaces and where demand would outweigh supply. We talked to wheelchair users of the club and after our suggestion and advice. The football club now operates a ballot system to ensure that all wheelchair fans have a fair chance of getting hold of tickets for these matches where demand is greater. This is rather than using the ‘first come, first served’ system. 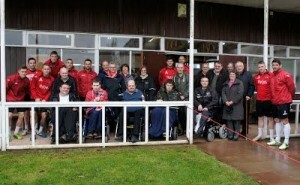 ECDSA member’s event: Members visited the football clubs Cat & Fiddle training ground on 3rd April. It was a wet and windy day but everyone enjoyed themselves and we all had a chance to chat to Paul Tisdale; Steve Perryman and the players and members were given a signed team photo as a memento of their visit. The event was to show ours and the clubs support to the Level Playing Field ‘weeks of action’ 2014 campaign. We’ve plans to make this an annual event for our members. Most Improved Player award 2013/14: Our members voted for whom in their eyes improved the most in the season and the award was presented on our behalf at the clubs end of season ball by David & Juanita Turner to a worthy winner in Tom Nichols. 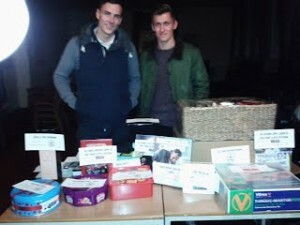 Donations: We’ve been able to give donations to the club and Supporters Trust on some projects. These being: 1 – ‘Light up the Park’. 2 – Have you ever played Brazil? ECFC book being launching on 12th July. 3 – Clubs memorial garden. More information to follow in our Treasurers report. Match day disabled parking: We continue to allocate disabled parking on behalf of the football club. This ensures that all disabled parking spaces are used on a match day by those with disabilities and in the past season we were able to fill every space. ECDSA Ambassador: At the end of the season it was with great pleasure to announce that we’ve been able to finally appoint an Ambassador for our association and if you don’t already know, we’ve appointed Premier League; FIFA Assistant Referee and local lad, Mike Mullarkey. We’ve already had a meeting with Mike on some exciting ideas which are to follow very soon. Mike is unable to attend this AGM, he has left me a message and he says “I am proud to have been invited to become your ambassador and how much I am looking forward to working with you all when I return from Brazil”. We continue to be very busy and the past year has been no exception. As your chairman and the clubs Disability Liaison Officer I sent a letter to the clubs CEO because of concerns over the 2014/15 season ticket pricing and the price rises for those with disabilities using designated areas and those needing a personal assistant. The following is what the issues were and what has happened so far. Renewal letters were sent out by the club that included pricing for a personal assistant. The current football clubs policy is that the PA ticket is given free by the football club as a ‘reasonable adjustment’. The club has now sent letters of apologies for causing undue distress to those sent incorrect information. Designated wheelchair areas were included in the clubs ‘premium seating’ pricing bracket for the Flybe Stand. These areas have never been included in this pricing bracket and were incorrectly added. This has now been corrected by the football club. Designated wheelchair areas were included in the Old Grandstand (family stand). 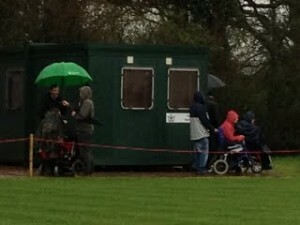 There are no areas in this stand for wheelchairs and was incorrectly added. This has now been corrected by the football club. Flybe standard concession and designated area full prices were the same price as the full ‘premium seating’ prices. This information was incorrect. This has now been corrected by the football club. I’ve made some recommendations and these are being worked on by the football club at present. However, I feel that if the right people within the club were consulted about the clubs disability policies, none of the issues above would have happened in the first place. The football club have assured me this won’t happen again. One thing our association has been involved with from the start and continue to do so is the South West Disabled Fans’ Experience Forum. The 3rd forum took place at Swansea City in October 2013 and it was another great success. Plans are afoot for the next forum, which is being held down at Plymouth Argyle in October this year. 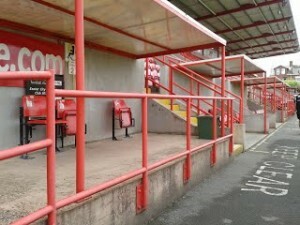 I hope as your chairman I’ve done what has been expected of me and if re-appointed I will ensure ‘as I always do’ that our association continues to help and support Exeter City Football Club in any way possible and ensure that all supporters with disabilities and their personal assistants are treated fairly, as you would expect. I would like to take this opportunity to congratulate both David & Jeanne Jones for both winning another award for all their volunteer work they do at Exeter City. The latest award was presented to them by the ECFC Supporters Trust and congratulations to Jeanne Jones by being awarded ‘Volunteer of the Year’ 2013 be Level Playing Field which was presented to her in the past season. Finally, I would like to thank our committee members for all their hard work and time given for the benefit of our members and Exeter City over the past season. Our members for their continued support and to Exeter City Football Club for allowing us to use their facilities again for free for our meetings and to all of you for attending this year’s AGM.